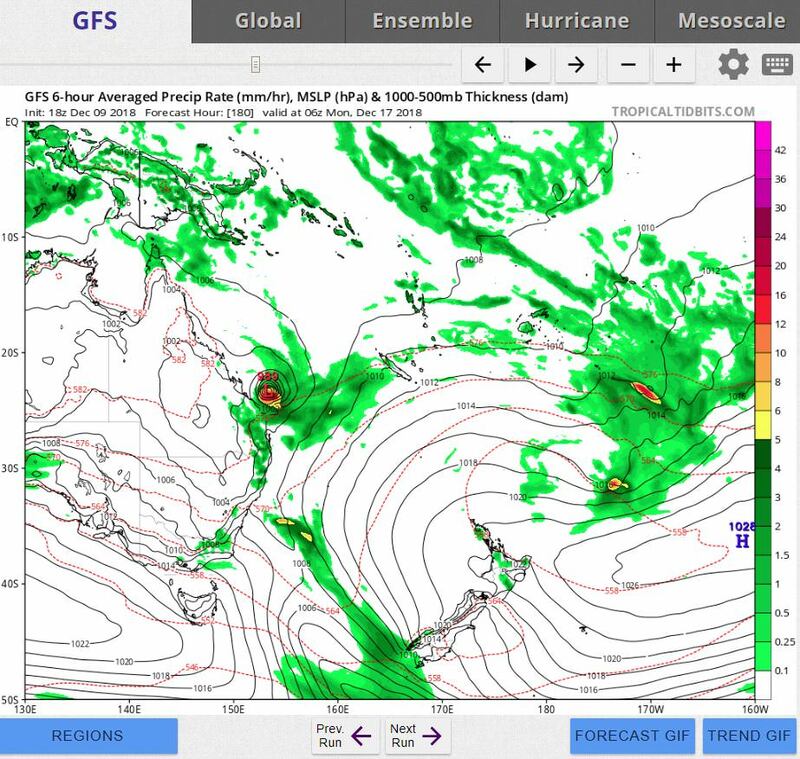 The weak low is now 1007 hPa. It's looks great at the moment. 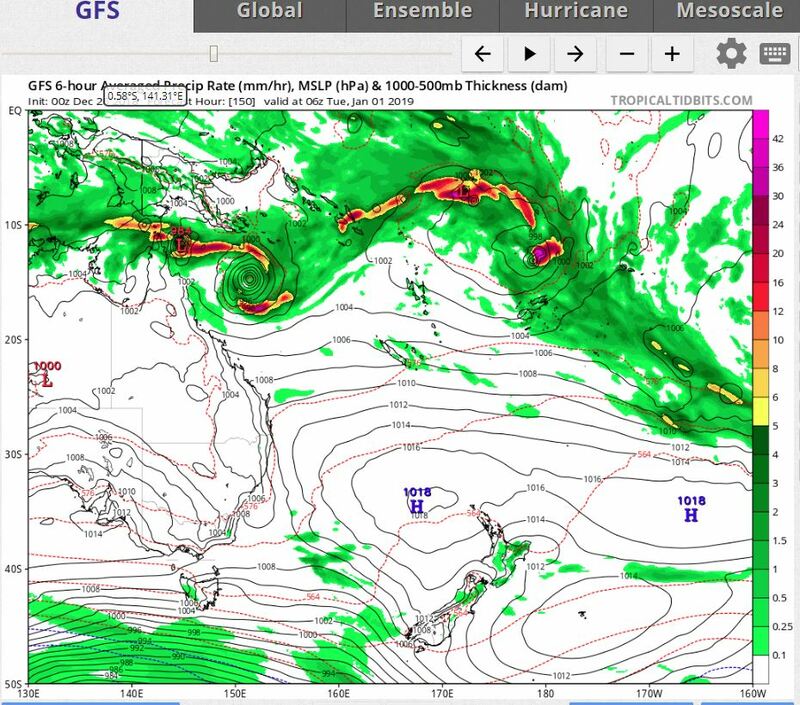 Just for the archives of this thread I'd like to share what GFS was forecasting a week ago for 4.00 pm today with the remains of TC Owen and what actually likley at 4.00pm today. 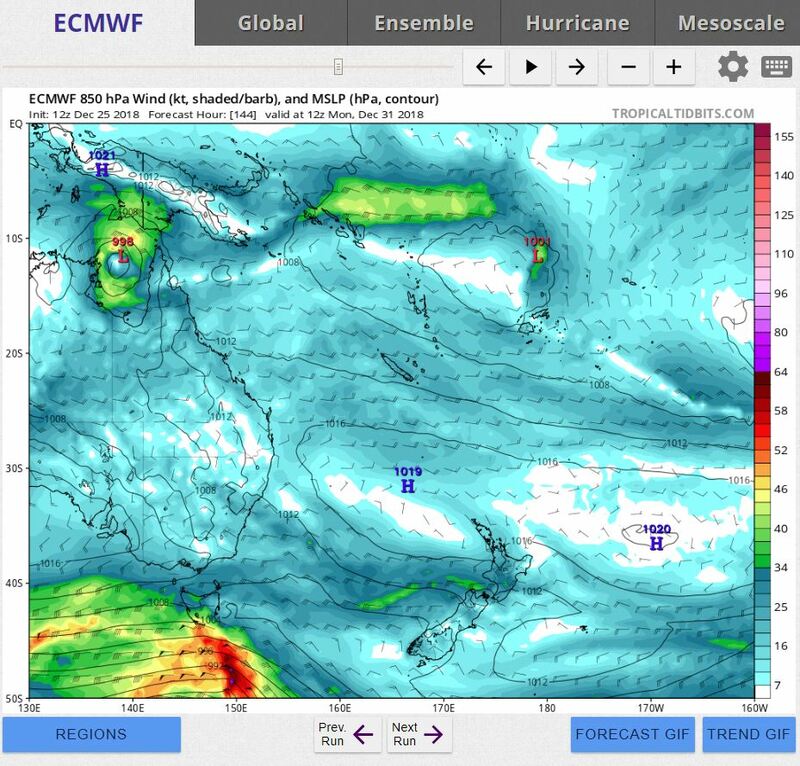 It cops a bagging sometimes ,and sometimes rightly so but it also offered up a far more realistic rainfall forecast for us locally than EC with EC still putting 500 mm of rain over the Bundaberg region as late as yesterday morning. The first image is the forecast run for today that was run on the 9th and the second is the run from this morning , for today. Quite remarkable really. 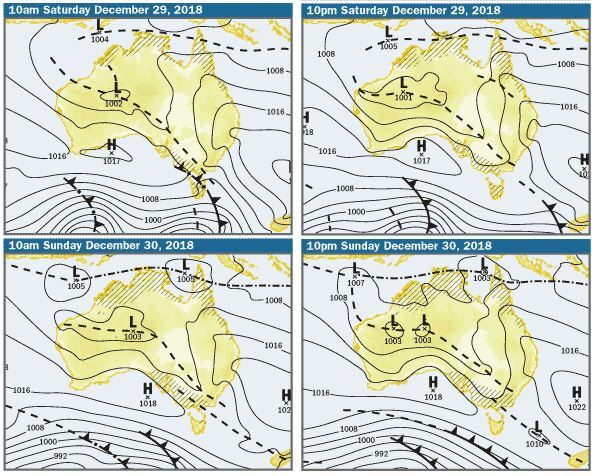 Even the placement of the Low in the Southern Tasman and those well out in the Pacific to the east is astonishing given the time frame. When was the last time Queensland had a cyclone in the season before Western Australia had one? Gotta love CMC's latest run. Owen is one tough SoB if this happens. For those who like browsing Wikipedia, the article on Cyclone Althea is today's featured article. Interesting reading there Rawhide..!..good to see the lessons learnt and the emphasis on improving building codes...it does make you wonder,though, what will happen if Townsville ever gets a direct hit from a Yasi-type storm.. If the houses in Darwin were built to the Cat 5 building code before TC Tracy, I think damage would have been far less. Fibro houses sitting up on high stumps was a recipe for disaster. Houses coming apart with people huddled inside would be something the survivors would never forget. What is the record number of times a cyclone has reformed? 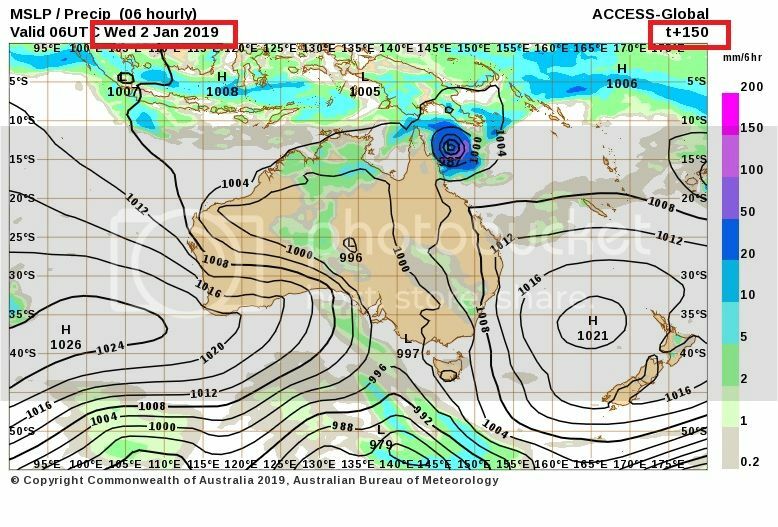 FV3 22 Dec 12z run forecast going wild for cyclone between Fraser Island and New Caledonia around 7 Jan.
Amazingly the remains of Owen are still spinning away off the FNQ coast. Yup. What a stayer he is! By the by the 28th the circulation will be a month old! while EC wants to develop a Low in the GoC. 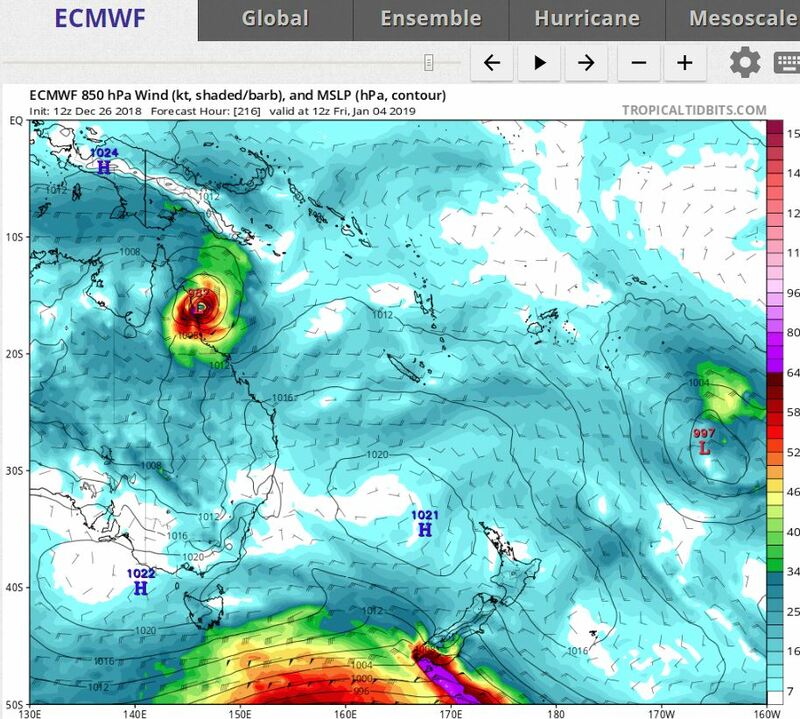 CMC also wants a Low/ Cyclone in the Coral Sea but has a completely different scenario to GFS. for the period until midnight EST Saturday 29 December 2018. In the longer term, the tropics are expected to become more active on the weekend, and the risk of a significant tropical low developing in the northern Coral Sea is likely to increase next week. 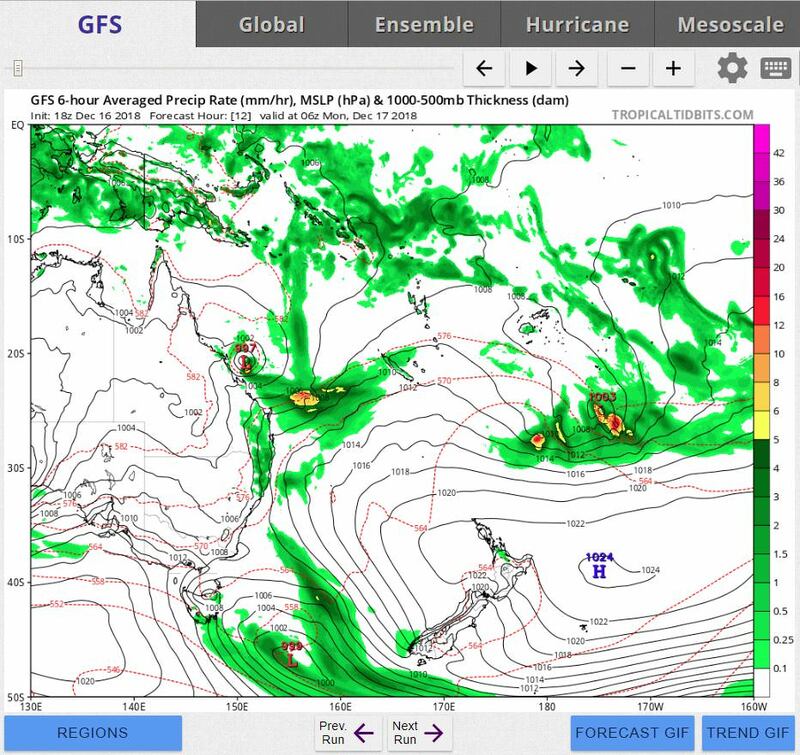 Well, the latest extended GFS has finally woken up to itself and given us what we expect at this time of year: development in the Coral Sea that quickly moves SE. ..and EC has dumped it's NT secenario and instead crosses a cyclone at Cairns after a recurve off the Cape. The joys of a MT full of possibility. Hangs around in the same place for 3 days dumping copious amounts of water up there. What caught my attention is the speed of increasing intensity in 24 hrs from 1st to 2nd Jan .A possible reason is a strong NW infeed, and a strong southern flank infeed . THe TC is very symmetrical. ACCESS badly underdoes the mslp on TC's . Have a look at the prediction 24 hrs after jan 1st. Most of the models want at least one Low up there but pretty much all whisk them off to the east or south east. Given the forecast of endless ridging in the CS I'm not really surprised.